This purple lotus flower ethical coin purse is a great gift for free spirits and those that believe in conscious consumerism! It is handcrafted by artisan co-ops and is lined, 5" by 4" in size., has a zipper closure, and has a cute pom pom pull. 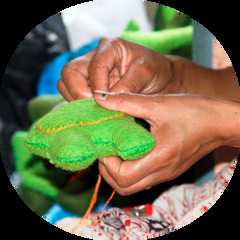 Each sustainable coin purse gives back to the artisan that makes them!